The Official Cambrige Guide to IELTS. Cambridge University Press, 2014. 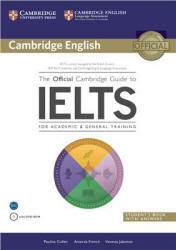 - 4000 p.
The Official Cambridge Guide to IELTS is THE definitive guide to IELTS. It contains all you need to succeed in the exam. Skill-building exercises cover all of the question types in the exam for both the General Training and Academic Modules. Our research into real IELTS candidates' exam answers - and the mistakes they make, helps you avoid the same ones! Eight official practice tests and a focus on test-taking strategy help you maximise your score. The DVD-ROM includes videos of the Speaking test, and all the listening material, including the tests, as MP3 files. IELTS is jointly managed by the BC, IDP: IELTS Australia and Cambridge English Language Assessment. This book is designed for candidates of any level hoping to lake the IELTS test. It is suitable for students working alone or in a classroom situation. The materials can be used for self-study, or can be integrated into an IELTS preparation course. The book is also a valuable resource for teachers who are preparing IELTS candidates. How can students of different levels use this book? The IELTS test has two modules: the Academic Module and the General Training Module (see the following pages for an explanation of the two). Each Academic Module candidate will take the same test, no matter what his or her English level is. Similarly, each General Training candidate will take the same General Training test. So, the information in this book is useful and important to students of every level. Lower-level language students generally need more guided practice and there are exercises in this book to provide this. However, they also need experience and practice in expressing themselves more freely, as this is what IELTS requires them to do. Similarly, more advanced students need frequent opportunities for self-expression, but they also need to become more self-critical and aware of their own common mistakes. Corpus research has shown that even high-level candidates make careless slips, so all levels can benefit from both controlled and free practice.